By this age range, kids should have a skincare routine. No, not just one where they splash a few drops of water on their face and call it a day. A skincare routine with products actually designed for them, made without harsh chemicals. A routine that is easy to follow, laying the foundation for good hygiene habits as they continue to develop into adults. So, when Tween Girl started to notice a change in her skin, it was perfect timing to start her on a skincare routine. There was only one roadblock though: which products should she use? I knew that she needed products that would work but that would also be kind to her skin. 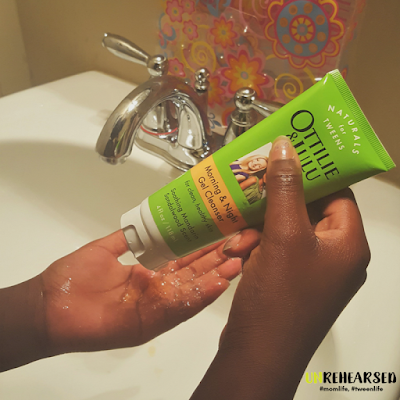 A simple Google search brought up Ottilie & LuLu, natural skincare products designed for tweens. Shocker! Who knew?!? I certainly didn't but I was very happy to see that there exists a company that serves this market. Think about it, for the first time in their lives, tweens must learn to be consistent in caring for their skin and need products made without any harsh chemicals. A part of Ottilie & LuLu's welcome statement says: "...formulas are filled with anti-oxidants, botanicals and vitamins." 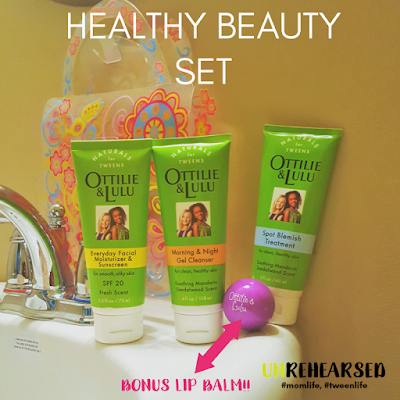 Ottilie & LuLu are so awesome that they sent Tween Girl the Healthy Beauty set to become a part of her daily skincare routine. Tween Girl and I were both excited, even more so once the package arrived in the cutest little colorful tote (yes, cute packaging excites us!). That very night, Tween Girl started using the Morning & Night Gel Cleanser. It only took a couple of drops of the gel cleanser to get a nice lather, which gave off a calming scent. Once Tween Girl rinsed, she mentioned that her face felt clean and soft. The next morning, she cleansed her face once more with the gel cleanser and followed up with the Everyday Facial Moisturizer & Sunscreen. With tweens, they think that more is better, so I had to keep reminding her that it only takes a few drops to do the job. With the moisturizer and sunscreen, one drop is actually best. Any more than that will cause the need for more minutes of rubbing it onto the face. If it's not rubbed in, it will reappear once your tween starts to sweat, mostly near the hairline. Once she learned how to use the proper amount, she gave the moisturizer a thumbs up because it didn't dry her skin like some of the previous moisturizers she had used. I like having the sunscreen "built in" with the moisturizer because moms don't have to worry about reminding her tweens to apply it. Her game plan to avoid pimples and blemishes (yes, it's possible!) is to continue cleansing her skin daily, drinking plenty of water, and not overindulging in sugary foods/drinks (cookies, candy, soda). 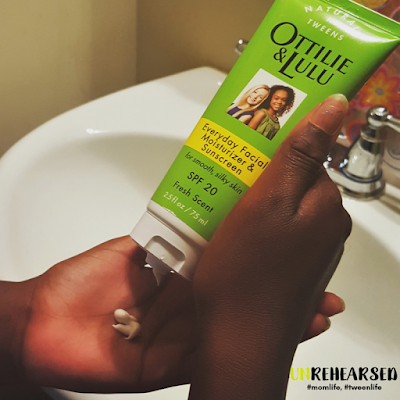 If we need help in the pimple/blemish area, Ottilie & LuLu has us covered because our gift set included a Spot Blemish Treatment. After a couple of weeks of using the products, Tween Girl has had few complaints, which is good considering that complaining is something tweens are good at. Of course, I have to remind her to wash both day and night, again that's pretty typical when raising a tween. I would rather spend time reminding her to develop a good skincare routine now instead of her battling skins issues down the road. 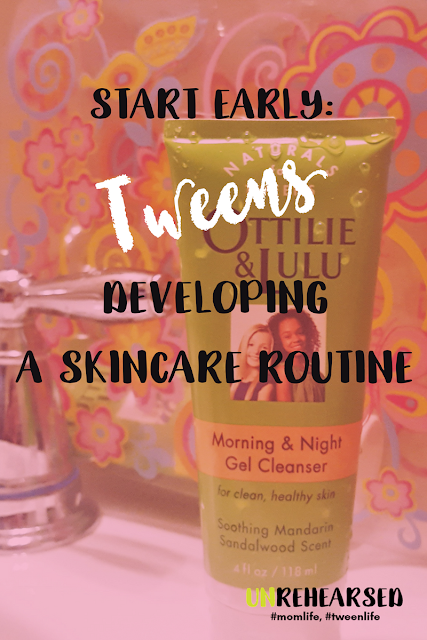 It's great knowing that there are products that will help parents instill good skincare habits into their tweens, laying the foundation for when they grow into adults. At what age did you start taking care of your skin? Disclosure: I was not financially compensated for this post. I received sample products for review purposes. The opinions expressed are my own.